Having twice battled breast cancer, Nathalie Le Prohon has first-hand knowledge of the “dire need for change and transformation” of the aging and often inefficient Canadian health-care system. “We’re moving and innovation is happening, but it’s not scaling up fast enough,” Le Prohon, the health-care industry lead for IBM Canada, told a packed auditorium at the MaRS Discovery District on Thursday. Le Prohon made the remarks during a keynote at the University of Toronto’s The Future of Health Innovation conference, part of Toronto Health Innovation Week. They weren’t so much a knock on Canada’s ingenuity or the quality of care being delivered by doctors, but rather the crushing demands being placed on the system and the sheer amount of money it will cost to meet them. In Ontario alone, spending on health care amounts to $60 billion a year – a figure that's only going to increase as Canada’s population becomes older and in more need of care. “The current system is not sustainable,” said William Charnetski, the province’s chief health innovation strategist, during one of the conference’s panel discussions. The good news is that Canada – and Toronto in particular – has recently emerged as a growing hub of health innovation and commercialization. U of T and its partner hospitals, long leaders in health research, are now surrounded by a proliferating array of research institutes, technology transfer programs, incubators, accelerators and other commercialization infrastructure – all designed to move novel ideas and technologies from the research lab into the broader health-care sector, giving the country an economic boost in the process. 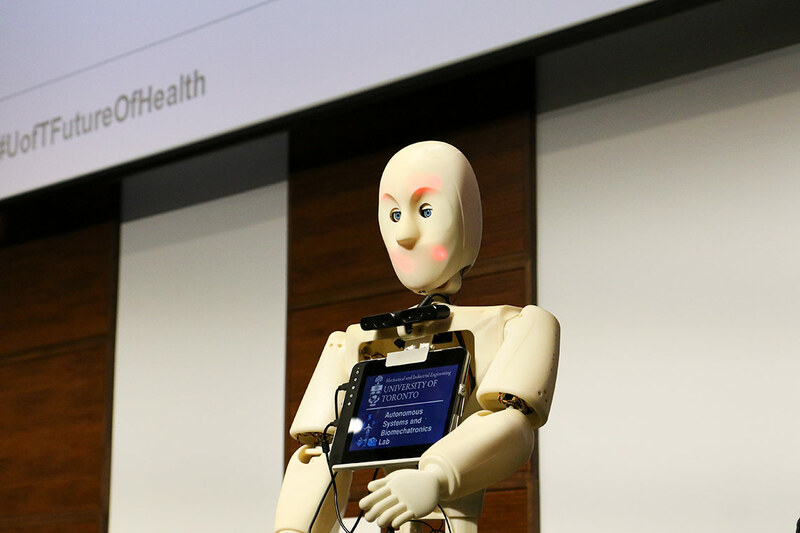 U of T's sold-out conference, which included an adjacent showcase of U of T health startups, focused mainly on two key areas where Toronto has the potential to become a leader: health technologies and robotics, and regenerative medicine. Goldie Nejat, a robotics specialist and associate professor in the Faculty of Applied Science & Engineering, painted a picture of a future where robots powered by artificial intelligence, or AI, – another field where U of T has emerged as leader – play a key role in everything from taking care of the elderly to helping reverse the effects of neurological disorders. Regenerative medicine is another area where Canada is positioning itself as a future heavyweight. The field is built around the idea that stem cells can be engineered to repair diseased tissue and organs – essentially helping the body repair itself. In 2015, the federal government provided U of T with a $114 million grant to develop the field, resulting in the creation of its Medicine by Design program. Michael May, the CEO of the Centre for Commercialization of Regenerative Medicine, says stem cell therapy companies have recently begun to attract significant investments. He noted for example, the 2016 creation of Bluerock Therapeutics, co-based in Toronto, New York and Boston, with a US$225 million investment by pharma giant Bayer and Versant Ventures, as well as a more recent $60 million Series B funding round closed by University Health Network spin-off Avrobio. There are, of course, still obstacles that need to be overcome. Stefan Larson, the CEO of U of T spin-off Northern Biologics and the entrepreneur-in-residence at Silicon Valley-based Versant Ventures, said there remains much untapped potential in Canada. He predicted it would take at least another decade before there were companies of sufficient size to generate the sort of dynamic investment climate that characterizes places like San Francisco and Boston, where big global players spin off countless startups and serial entrepreneurs. Nevertheless, “we’re starting to double down on Canada,” he said of Versant Ventures. The conference ended with a word of advice from Catherine Zahn, the CEO of the Centre for Addiction and Mental Health and a professor in U of T's Faculty of Medicine. Referencing the great strides organizations like CAMH have made in “bringing justice to people with mental health illnesses,” Zahn suggested Canadians resist the temptation to look for quick fixes and embrace the long slog that is often required to make meaningful change. Otherwise, the task can seem overwhelming.